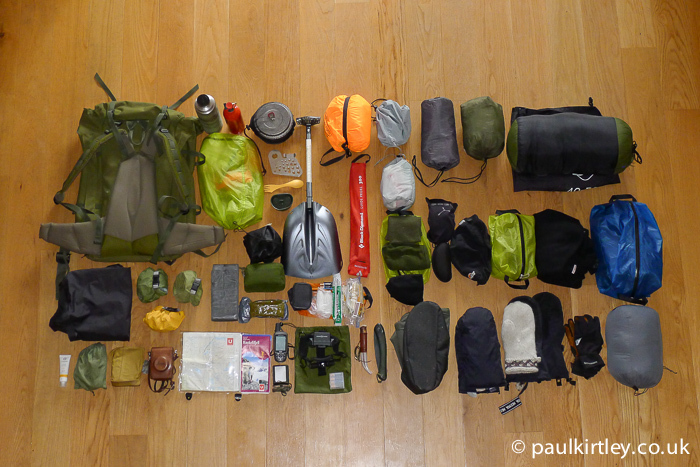 Kit for ski touring in Norway, 2014. Photo: Paul Kirtley. Good kit selection for winter expeditions in the mountains is essential. Whilst ski touring in remote areas, your backpack and its contents are your life support system. So in this context “good kit” means effective and reliable. Most of the time it’s about being comfortable, well fueled, well hydrated and efficient but at the extremes, your life depends on it. Your backpack is also your survival kit. Above the tree line you are very exposed to the weather conditions and largely reliant on what you carry with you for creating shelter, whether it is a bothy bag for lunch stops and emergencies, bivouac kit, mountain tent or a shovel with which to dig in to the snow. Your first line of defence, of course, is your clothing. It needs to be suitably protective but also adjustable enough for varying conditions and levels of physical exertion. Other kit from navigational equipment to head torches need to work in the cold. A very small figure in a large , bleak winter environment. Your backpack is your life support system. Photo: Paul Kirtley. I generally find that kit for winter use needs to be robust. Cold temperatures make many materials brittle. Things freeze up and you exert more force than in easy summer months. You may be wearing gloves or mittens and they can also make you somewhat more ham-fisted. Durability is key in winter. So your kit needs to be effective, reliable and durable. But you also need to transport it. 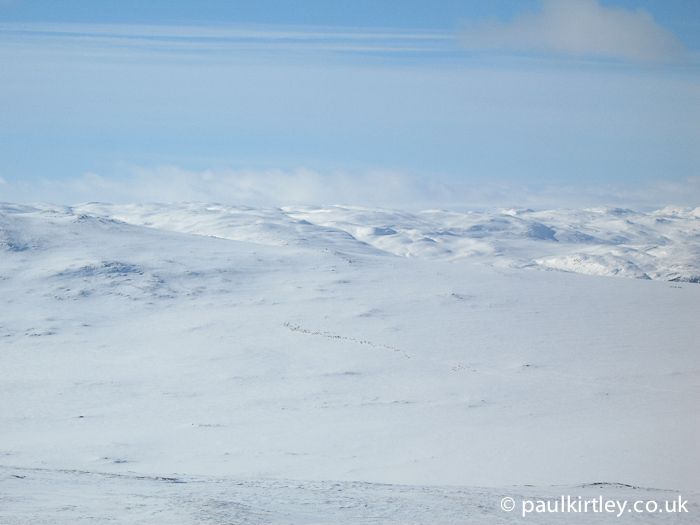 Unlike hiking in the summer, on a ski tour you can take a pulk. You also need more calories to stay warm. 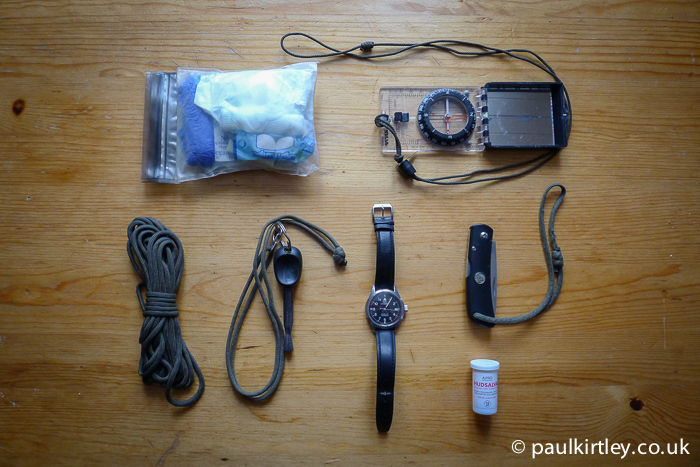 So, on longer trips you may well have to take a pulk unless you can resupply with food. A backpack on its own, however, allows for more deft movement across terrain than a pulk. So, I prefer not to take a pulk unless I have to. Pulks allow you to transport more food or equipment but are more awkward to ski with than just a backpack. Photo: Paul Kirtley. Either way, pulk or no pulk, your kit for ski touring adventures should be as light as possible (while remaining effective, reliable and durable). This combination of specifications can sometimes, although not in every case, translate to expensive. I make no apologies for the cost of any of the kit I use. With winter kit, cost is not my first consideration. Performance is the key criteria. Of course if there are two items of equal performance but differing price, then I will make a price based decision between the two. Ultimately, though, I want kit that works and keeps me safe. Having a few extra quid in the bank is not going to make any difference if my hands are frost-bitten or I’m dying of hypothermia. Also, some of the items in my kit are not easy to obtain in warmer climates. Some can only be purchased locally in cold places. Some items could be replaced with cheaper alternatives without much consequence. With other items I would caution against this route, particularly if it adds more weight or bulk to your kit. For example, even though the down sleeping bag in this kit list is much more expensive than a synthetic bag of equivalent warmth, it weighs more than a kilogram (2.25 lbs) less. A down bag also compresses more easily, meaning an overall lower pack size and better balance while on skis. Other items could be replaced with more easily available items, possibly with some reduction in flexibility (e.g. cabin slippers instead of overboots) or a reduction to a still acceptable level of performance (e.g. mountaineering Dachsteins instead of traditional hand-knitted Lovikka). Some items in my kit may have been superseded by more recent updates or even new models. As I’ve already mentioned, I buy things which are durable. Plus I look after my kit. Hence, it tends to last me a long while. For those unfamiliar with the concept of ski touring, the idea is to make a self-propelled, and often self-contained, winter journey. This can include camping in mountain tents, bivouacking in snow shelters or staying in huts. A DNT maintained mountain hut. Haukelifjell, 2014. Photo: Paul Kirtley. 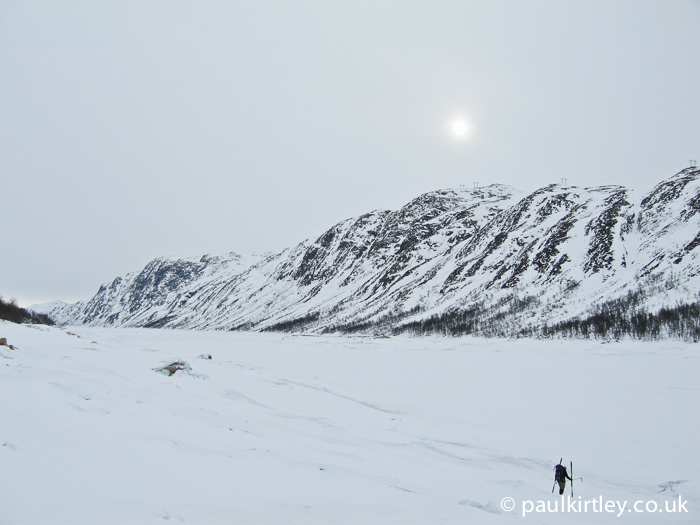 This article is based on my clothing and equipment for ski touring adventures in Norway. If you want to get a better idea of what this style of ski touring entails, watch my film Fjelltur: A Norwegian Adventure here. The DNT (Norwegian Trekking Association) maintains an extensive network of huts. Trips can be planned to travel from hut to hut and this is what most people seem to do. The most popular winter routes are often marked with birch sticks or canes. These should not be your only navigational aid, however, as they may not be present on every section of your planned route (e.g. only from the road head out to the first hut in an area) or they may have been blown over by winds or even chewed by reindeer. The brown streak in the centre of the photograph is a herd of reindeer. This should also give you some idea of scale of this landscape. Eastern Setesdal mountains, 2010. Photo: Paul Kirtley. 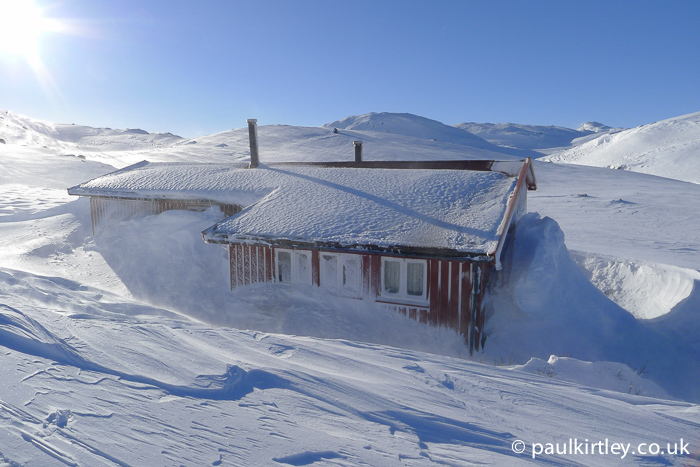 Winter distances between huts are often up in the high teens of km (10 miles +). 20-25km (12-16 mile) legs are not unusual. In high winds or poor visibility, covering these distances during the hours of available daylight becomes a challenge that needs to be taken seriously. Good navigational skills are required. Even if you are planning to travel from hut to hut, you should equip yourself for the possibility of spending an unplanned night out due to poor weather, navigational error or a member of your party being injured in a fall. Some DNT huts contain a food store, from which you can take items, pay for them and use in the hut. Others do not contain any food. Some huts have guardians who are present on site some or all of the year. A relatively small proportion are run like simple mountain hotels. These are typically near to a road (e.g. Haukeliseter) or railway station that is used regularly as the jumping off point to access an area (e.g. Finse). Which type of hut is which – stocked, unstocked or manned – is shown on some map series. More details are available from the DNT website. This information is clearly useful in planning your journeys. A combination of carrying some dehydrated meals and using food stores in stocked huts, if planned well, will get you a long way without you needing to carry an excessive amount of weight. The author’s ski touring equipment. Click on the photo to see a much larger version (opens in new window). See below for numbered list. Photo: Paul Kirtley. Most things are harder to pack in cold conditions than in warm conditions. Make sure you have a sizeable rucksack to make packing the necessary kit easy. But don’t fill it for the sake of it. I use a Berghaus Vulcan. I don’t use side pockets when I’m skiing. A 1-litre (2 pint) unbreakable vacuum flask for drinks during the day. I can have a hot drink or add snow to my cup for a cool drink (and increase the volume I intake without having to carry it). A selection of high calorie food with little or no water content. This is important for two reasons – 1/ water is heavy (1kg/litre) and there is plenty about you in a snowy landscape as long as you have access to heat; 2/ water freezes in sub-zero temperatures and some foods or packaging are damaged by this. I will be expanding on what we took in a separate child article. MSR fuel bottle containing Coleman Fuel. MSR titanium cooking pot containing MSR XGK stove and spares. I prefer a liquid fuel stove over gas-canister stoves in cold environments. You don’t suffer the same pressure issues in low temps. The XGK line of MSR stoves have never been subtle but they are robust and great for melting snow and boiling water. On the trip where this photo was taken we didn’t plan on using a stove at all as we were going from hut to hut. The stove and pot were carried just in case we got stuck anywhere between huts. This folds out to form a base on which you can place the stove to help prevent it sinking into the snow underneath it. Wooden or plastic – whatever I have to hand when packing. I tend to avoid metal in the winter. Great to keep in a pocket. Used with vacuum flask. Readily available in Scandinavia. Bag to keep all of that day’s lunch together so it can be quickly and easily accessed. Even if you don’t end up using it from one trip to the next, this is an incredibly important piece of equipment. It allows you to dig in and create a shelter in the snow if you need to. It gives you a better chance of digging companions out of the snow if they are avalanched. It can be useful for digging your way into cabins when they are drifted over. I use a smaller, more compact shovel than the shovel I recommend for winter camping and travel in the Northern Forest. This is partly because it needs to fit on your pack neatly. In the mountains you have different snow conditions than in the forests. While in the forests the snow stays light and fluffy and you almost sweep the snow out of the way so a large bad is more beneficial, in the mountains it becomes compacted wind-blown snow and can be very hard. A shovel with a shallow V-shaped blade edge is preferable for carving the hard snow. This is useful both for digging into the snow and for shaping the inside of shelters. Being able to shape the inside of snow caves is another reason why you don’t want to large and unwieldy a shovel. I would recommend you avoid shovels with plastic blades. They break at the most inopportune times. Also avoid the rounded ball grips such as on some Fiskars shovels. They provide a universal grip which can be used with finger gloves or mittens but while solving that problem they create a host of others particularly when creating snow shelters. If you get even the slightest bit of snow or frosting on the palm of your glove, you lose all purchase on the ball. Consequently you cannot create any torsion on the shaft of the shovel. A telescopic shaft with a D-shaped or T-shaped grip is what you should purcahse. I use the Black Diamond Transfer 7 shovel. 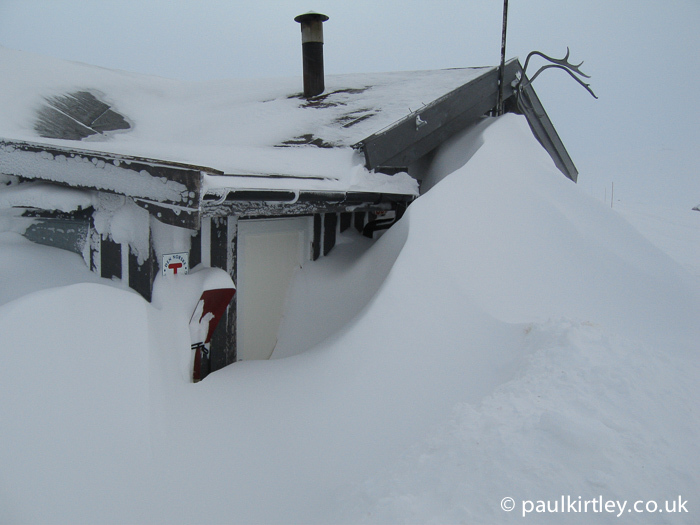 While you may never have to dig a snow hole, you will likely have to dig your way into a hut. Typically, there are shovels on the wall as in this example but the whole front of the hut could easily be drifted over. Be safe – carry a shovel. Western Setesdal mountains 2007. Photo: Paul Kirtley. Group shelters or bothy bags are great for quick emergency shelter as well as planned use at a lunch stop. If you are not familiar with them, they are like a tent outer that you and your companions can sit inside. There is normally a lip at the bottom edge that you can sit on to keep your backside dry as well as anchor the shelter to prevent it being taken by the wind. The shelter traps air and you and your friends will warm it quickly with your body warmth. If you carry one in a bright colour, they are also effectively a marker panel, good for attracting attention to your location if necessary. They can even be used as a casualty wrap or even an improvised stretcher. I’m a big fan. 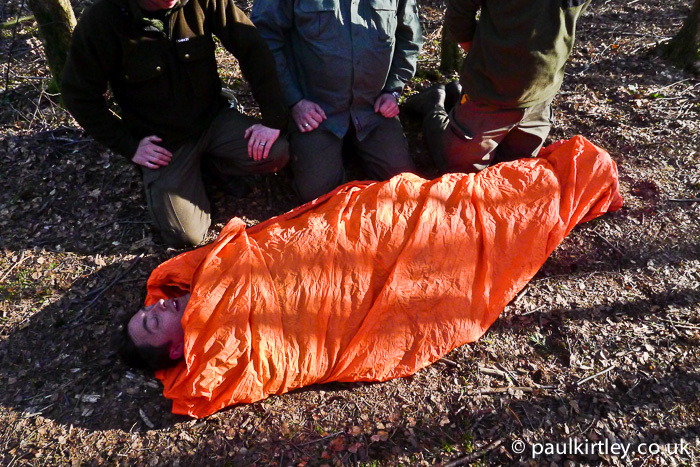 Group shelter, or bothy bag, being used as a casualty wrap in a first aid training scenario in the UK. Photo: Paul Kirtley. A 300cm (9 ft) long folding pole with a construction similar to a modern aluminium tent pole. A snow probe is an important avalanche search tool but they are also very useful for gauging the horizontal extent of snow before embarking on digging a snow hole. Rolls of sticky-backed carpet-like material attached to the base of skis for climbing slopes when snow conditions are such that grip can’t be maintained with technique or use of wax. They can also be used to significantly slow down descents of slopes, which can be useful in low visibility. A selection of stick waxes for application to my skis. Wax is used to enhance glide as well as grip. Different formulations glide or grip at different temperatures of snow. I have Swix V-series white, green, blue, red, red-silver wax as well as klister, a scraper and a cork block applicator. In case of snow-holing or other bivouac. I take a light weight three-quarter length model in Thermarest’s Pro-lite range, the lightest self-inflating mattresses avaialble. Gore-tex bivouac bag primarily to protect my sleeping bag from snow while snow-holing. The model here is by a defunct company Mountain Range. I’m currently looking for a replacement for this bag. Used for sleeping in cabins as well as potential snow holing and other bivouacs. Even in the huts it can be cold. Not all bunk rooms are heated and I’ve slept in plenty that are below freezing. It can be warmer in a snow hole than in some huts. I take a sleeping bag which would allow me to bivouac at the outside ambient temperatures I might encounter. The RAB goose down bag I take has a comfort rating down to -25 degrees Celsius (-13 Fahrenheit) and with thermals on, I have bivvied out in the open at -35 Celsius (-31 Fahrenheit) in the forests of northern Scandinavia in this bag. I’m highly confident in its performance. RAB tend to improve their bags year on year. My bag is a discontinued model. If I was looking for a replacement model which produced now it would be the RAB Expedition 1200. N.B. my sleeping bag has it’s own dedicated dry bag. Spare base layers in case the ones I’m wearing get wet. I use Janus black merino wool roll-neck tops and Icebreaker leggings. In this section I also pack a 400g Woolpower top, which I wear while skiing in very cold conditions or more generally around the hut in the evenings if its chilly. A Woolpower 200g top which I will wear over my base layer top if needed. Icebreaker 200g boxers and Thorlo Mountaineering socks. 1 spare pair of each. The Lowe Alpine Mountain Cap is a classic and perfect for unpleasant conditions in the mountains. I love how it keeps my ears protected from wind chill. While most of the time I wear Bollé sunglasses while skiing, good quality ski goggles are worth their weight in gold when the weather really craps out. When snow is blowing in your face, you can see much more easily while wearing goggles and they really help protect your face from cold winds. I use Cebe goggles. I don’t recall which model but they are very good. Sunglasses are important for eye protection, even in overcast conditions. They also allow you keep your eyes open and so to see better in windy conditions, particularly when there is a good amount of spindrift snow. As a wearer of contact lenses, good eye protection is important in these conditions. The glasses I use are a model from about 5 years ago by Bollé. A wool neck warmer. Essential. For me, this goes on when the weather gets really bad. I don’t tend to wear it otherwise. It tends to come out at the same time as my goggles. It’s also great for really cold bivouacs. A woolen beanie style hat is essential and I often carry two. You want to keep your head warm but you don’t want to overheat. You also want to keep your ears warm when necessary. You might be tempted to ski without a hat at all but the issue is that even though you are generating lots of heat through physical activity, if you don’t wear a hat your brain can get a little cold (so I’m told) and this results in your thinking judgement being a little impaired or at least experiencing an ice cream headache. I’ve certainly felt fuzzy while skiing in cold conditions in northern Sweden without proper head protection. My favorite light had for skiing is a double-layer of very finely woven New Zealand merino wool I picked up 15 years ago in an independent camping store in Kilburn, London. I wish I could find another one! It should be self evident why you need this. The one in the picture above is very similar to the one described in detail here but I now use Israeli dressings instead of the old field dressings and I have ditched the canvas pouch in favour of a better quality one in Cordura. A second Israeli field dressing, in addition to the one in my first aid kit. This one sits in the top pocket of my rucksack and can be accessed very quickly. It’s a tip I picked up from one of my ML trainers. Having a dressing immediately to hand is useful for head and facial injuries, which are often the result of falls. Sam Splints are malleable aluminium covered in foam. Used for immobilisation. A X-small Exped dry bag containing toilet paper, antiseptic wipes and alcohol hand sanitiser. More on hygiene in the field in my free videos here. Another X-small Exped dry bag containing wallet, phone & spare battery. A small Exped dry bag containing GoPro camera, spare parts, spare batteries and lens cleaning kit. A large capacity (100 litre/22 gallon) waterproof rucksack liner. More on field hygiene in my free videos available here. The Leica D-LUX 5 is a superb little camera. Great lens. Sharp landscapes at low ISOs. Super close focusing in macro mode. Nice portraits. Very good battery life. It is a great all rounder and has been on a lot of adventures with me. Things are moving on, however, and its video resolution and low-light shooting capabilities are somewhat underspecified compared to what is now available in compact cameras. And yes, to boot I have been thoroughly spoiled by my Nikon D800. You only need look at my Bloodvein canoe trip photos. But I could never take a camera of that size and weight on a ski tour. I still love the portability of the D-LUX 5 and it has proven a great tool for capturing my experiences. Local 1:50,000 touring map combined with Ortleib waterproof map cases (the best map cases in my opinion). Carried in a large Aloksak. Get organised with your spare maps and information then make sure they are protected. Photo: Paul Kirtley. I generally don’t use GPS very much for navigation. I’m very comfortable with map and compass and related techniques. But one thing I find hard while skiing compared to hiking is pacing. When you walk, you can count paces and approximate your distance. This works well over shorter distances but becomes tedious over longer distances. Over longer distances you can also using timing to great effect. While skiing, however, your pace and timing are much less steady. You go much faster downhill than you ever would walking. There is greater variability in how far you go in a given time. Snow conditions and visibility have a dramatic affect on your progress. Hence, in really poor visibility it is much harder to navigate by dead reckoning while skiing than it is when walking. Therefore, I like to have a GPS just to double check – and sometimes correct – my known position. I have the GPS set to the correct local datum so it displays a grid reference on the maps I am using. This is all set and tested before we leave. I have the GPS unit turned off most of the time to preserve battery. If I want to check my position, I first do my best to estimate it using the map and compass. I then turn on the GPS and wait for it to pick up enough satellites to provide an accurate grid reference. This way I either confirm the position I thought or correct it. To preserve batteries I then turn off the GPS, put it away and continue. I literally only use it for providing an accurate grid reference from time to time in really poor weather conditions. What I don’t do is ski around looking at the screen. I don’t have maps loaded onto the unit. GPS, map and GoPro camera. In the conditions you really need the GPS, the camera is useless!! Photo: Paul Kirtley. I believe in strong map and compass work combined with maintaining an awareness of your surroundings. Only a couple of times on the whole trip in 2014, which we filmed for Fjelltur, did we need to use the GPS. One of these occasions was quite amusing to me. I’m good at relating the shape of the land I can see to the contour lines on the map but the map I was using had a 20 metre (20 yard) contour interval. I thought we were towards the end of a lake where it should narrow and we needed to head off up the right bank. The light was flat, visibility low. We were in the cloud and it was snowing intermittently. Everything looked a grey-white colour and we could not make out any contours. All I could make out was a black rock wall about 10 metres (30 feet) away to our left which seemed to be part of a set of cliffs rising up from the edge of the small frozen lake were were on. But the map did not show any cliffs at the location where I thought we were. I strained my eyes and then I could just make out the top of the cliffs. They were maybe 8-10 metres (25-30ft) high. The reason they didn’t show on the map was that they fitted between the contours. So this, the only discernible feature I could make out through 360 degrees around us, didn’t register on the map. Here, a quick judicious use of the GPS quickly told us that we were where I thought we were. We were then able to proceed on a bearing in the direction we needed to head. The model I have is a model from a few years ago, the Garmin 60CSx. A current model similar to this is the Garmin 62S. Personally, if I was in the market for a new GPS at the moment, given I don’t want a mapping functionality, only something to confirm grid references, I would be looking at the Garmin Foretrex 401, which is a much smaller unit and wrist-wearable. Given the size and weight advantage over my current GPS unit, I may well invest in one of these units soon. The Silva Expedition 15 TDCL is a fully-featured and well proven baseplate compass with sighting mirror. As described here, this is my preferred compass. A powerful headtorch is important in winter. It’s dark a lot of the time. I like one that also has a fine adjustment so I can read without dazzling myself. Having broken more plastic-bodied head-torches than my bank balance cares to remember, I bought a comparably expensive SureFire Saint model (which is a Surefire Miminus with an external battery pack). It is brilliant, literally and figuratively. It takes CR123s or AAs. Plus Surefire lamps work with lithium batteries, which will damage some torches. Lithium batteries are not only lighter than alkali batteries, they perform much better in the cold. Take plenty of spare batteries for winter travels. The Saint is no longer produced but the current range of Surefure headlamps is here. There isn’t much need for a belt knife above the treeline but there is wood available in the huts. I take a small fixed bladed knife, which can be used for feathersticks and woodcraft. The one I take is a lovely, small Saami knife I purchased in northern Sweden. It’s razor sharp but much lighter than your typical bushcraft-style belt knife. From cutting small firewood in the valleys to cutting snow blocks in the mountains, a folding saw is such a good utility tool. It’s more important than a belt knife for this sort of trip. There are often very keen prices on Amazon here. These are overboots I bought in Sweden. They are made by Lill-Sport and are replicas of a model used by the Swedish military. They have always seemed to be difficult to get hold of and I can’t even find them on Lill Sport’s website as I write this. They are designed to be warn over your boots. They can be worn on their own too. They are made of a tough woven nylon material and come up to just below the knee. There is a draw cord at the top to help seal them from snow. They have a tough sole which is randed up around the sides of the foot too. Inside there is teddy-fleece insulation and there is a removable semi-stiff insole, which is designed to protect the inside of the boot from the soles of cleated boots. So they are dual purpose, providing extra insulation over ski boots when stationary in extreme conditions, in emergency shelters, etc., but also for use as hut boots which can also be worn on their own in the snow for short trips to woodshed, outside toilet, collecting snow for melting (from a different area to the outside toilet). The advantage of the latter is that once you arrive at a cabin, you can take off your ski boots and leave them up in the rafters drying and airing as well as allowing your feet some valuable recovery time out of the confines of your boots. When you use only cabin slippers or fleece booties around the cabins, you have to put your main boots, and maybe your gaiters, back on again each time you want or need to go outside. You can read more about my primary mittens below. As a back-up I carry a set of Hestra Primaloft Extreme Liners. The are very warm yet lightweight and they compact down to low volume so take up little weight and room in my pack yet are there if I need them. I always carry spare mittens in cold climates. If you lose the use of your hands, you’re dead. In my view hand-knitted carded wool gloves from Sweden known as Lovikka, eponymously named after the village of Lovikka are the best you can buy. These are the warmest, most comfortable cold weather mittens I’ve used. They were first recommended to me by Lars Falt when I worked with him on courses in Sweden. I have several pairs. One pair I use along with the Hestra Bivak mitt for winter camping trips in the northern forest (click here to read more). The other set I use for ski touring along with a lighter, more water resistant set of overmitts. I like a leather overmitts in the dry cold of the boreal forest, where I will also be carrying logs and undertaking other activities which would damage more delicate outerr. In the changeable conditions of the southern Norwegian mountains, however, I like an overmitt which can cope with everything from cold dry to sleet to freezing rain, digging into huts and excavating snow shelters. I also like overmitts which are easily folded around ski poles and have good grip on them. I found the Hestra Seam Sealed Shell mitten to be excellent for the job. I first tested these mittens up in the Arctic forests for Woodlore and afterwards bought myself a set. These work well with both Lovikka and the Hestra Primaloft Extreme mittens listed above. Remember they are like a breathable jacket for your hands and they can also be used in wet snow conditions on their own over fingered ski gloves to prevent you from getting wet gloves and hands. I find them to be a very versatile solution. Plus they only weigh 175g. I understand that Hestra have suspended production of these gloves for the time being due to production problems. Their Pullover Mitt is similar. I have a relatively inexpensive set of cross country ski gloves by Outdoor Designs which I absolutely love. They have nice leather palms for grip and the slightly stretchy material means they are close fitting yet not too tight. They are just the right thickness to protect my hands from wind but not to overheat and get sweaty like some heavier gloves. They don’t have any breathable waterproof membrane in them so while they will get wet in damp conditions, they will dry out quickly. If there is a chance of them getting wet (e.g. 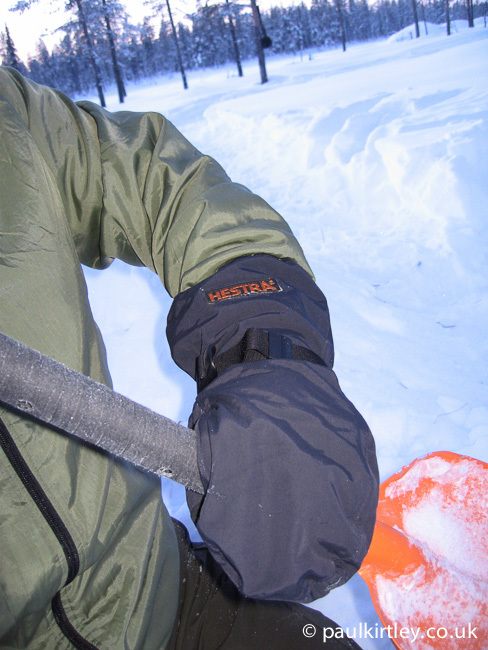 while digging a snow hole), I put the Hestra shell mitts over the top. Your mothership jacket is a large jacket which will go over everything and keep you warm. When you ski you generate a fair amount of heat and you do not want to sweat excessively. While skiing, I’m often relatively lightly dressed in thermal base layers and shell layers. This is fine for movement but when stationary you get cold quite quickly. A mothership jacket is great for when you are getting ready to move. You can keep warm and cosy yet take off the insulation in one fell swoop at the last minute and be ready to go. Unlike putting on extra layers under your shell, you don’t need to be stripping right down to your base layer to put on or take off this insulation. Keep the wind and the snow out by keeping your shell on and throwing the mothership over the top. I stuff mine in the top of the main compartment of the rucksack, allowing it to conform to what’s packed underneath (that is not packed into its own stuff sack). I can then grab it and put it on quickly when we stop for more than a few minutes. 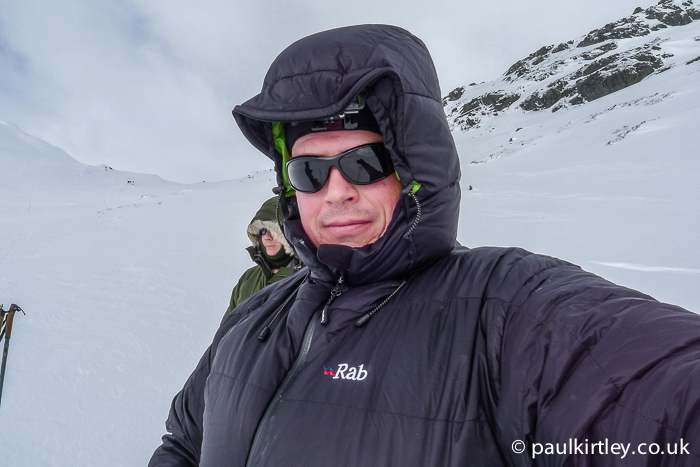 I used to use a synthetic model by Nanok but now use a RAB Neutrino Endurance down jacket, which is light for the warmth and also has a fully featured hood. RAB have introduced a hydrophobic down treatment which helps keep the down from clumping due to moisture absorption. It also has a Pertex Endurance outer shell. For very little additional weight, the Endurance fabric adds a significant level of performance and is something I look for in down jackets and sleeping bags. It is a water resistant fabric which helps prevent moisture from being absorbed by the down and is also windproof. These properties help the jacket to maintain its thermal performance when exposed to the elements. These jackets aren’t cheap and I have to admit buying mine on something of a whim in the autumn of 2013 while stopped at Tiso on the outskirts of Perth on my way up to a canoeing trip in the Scottish Highlands. I’m so very glad I did buy it though. It was performed so well in the changeable, unpleasant weather on our March 2014 Norwegian ski tour. I have also used the jacket in other circumstances and will be writing more about it in due course. I use Granite Gear Air Zipsacks to organise some of my clothing – particularly the woolen items – and keep it organised in modular packs. It also protects my spare clothes from atmospheric moisture and snow when I open my main pack outdoors. These small things make a big difference when snow-holing. Woolen clothing picks up snow like velcro picks up fluff. If you choose heavy duty stuffsacks for this role, you’ll add a lot of weight to your pack. The Granite Gear Zipsacks are very light for what they are. The largest one (the blue one under #18) has 16 litres capacity but weighs only 48g. The stuffsack I used to contain all my food is also by Granite Gear stuff sack of the regular drawcord variety. This weighs 29g. When you utter “wilderness trip”, some folk put large knives and axes at the top of their packing lists. In some circumstances that will be the right thing but on this trip, some may be wondering why we didn’t carry larger cutting tools than a 3 inch bladed knife and a folding saw. Well there really isn’t anything to cut above the treeline. Plus, below the treeline any bushcraft techniques we would be doing is small scale – small fires to cook lunch, cutting a few green sticks to spit a sausage and the like. In terms of emergency situations, in most cases once you are down in the valleys, you are necessarily closer to habitation. I can’t envisage an emergency situation where having an axe with us would be of benefit over and above what we already carry, whereas there would be a clear disadvantage to adding more weight to our packs. And while there is firewood up in the huts, there are also the tools to deal with it. 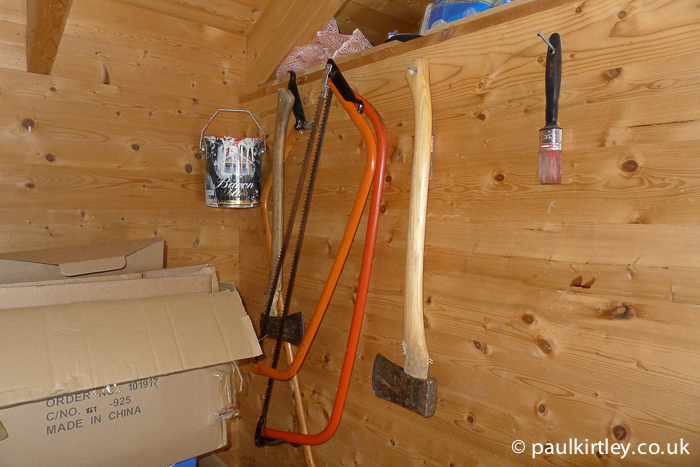 Each woodshed has the tools you need. Photo: Paul Kirtley. My base layers and shell layers are not included in the above main list and numbered photo. Shell layers in the mountains need to be very protective, particularly against wind. They also need to be breathable and have the facility for you to adjust the venting substantially. When it is cold enough I like to use a cotton smock as cotton is more breathable than breathable waterproof fabrics, particularly in really cold temperatures when water vapour can condense on the inside of the membrane rather than passing through. Cotton also does not stiffen like plastic-based fabrics do. 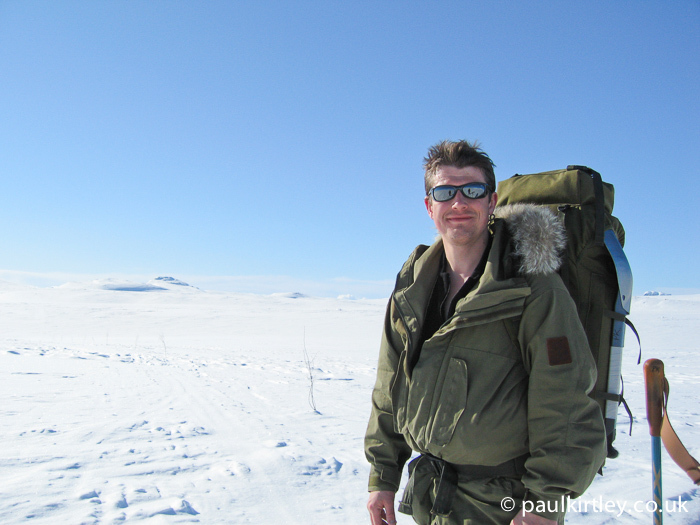 For many years I have used the Norrona Arktis Anojakke, now re-named as the Svalbard Jacket . The previous day was a whiteout. Here I’m heavily venting the Norrona cotton shell jacket. 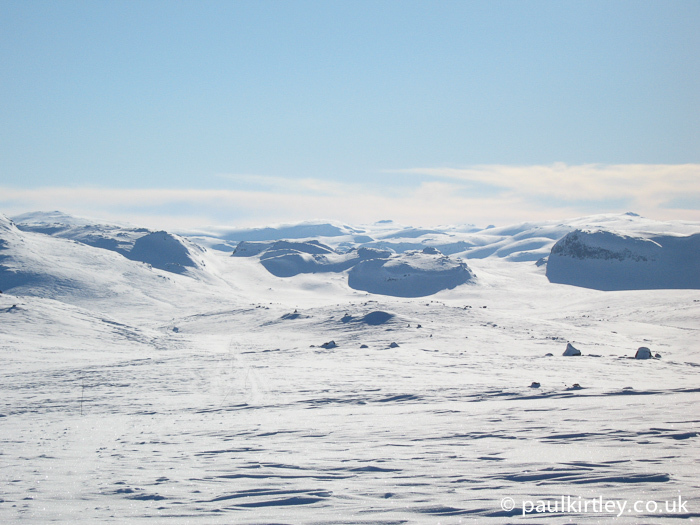 Hardangervidda, 2010. When the weather is possibly milder, more changeable or there is chance of wet precipitation, then I’ll pack a triple-layer Gore Tex jacket of a very similar design in the Norrona Recon range. I also generally use the Recon trousers, whichever jacket I’m using. I find the Norrona Recon range to be very protective. It’s designed for use in the Norwegian mountains. These garments are well designed, well made and robust without being excessively heavy. All of these items are 10 years old and still going strong, so just to be clear my garments are the old model Recon range. You can find out more about the latest Recon garments here. I have yet to try the newest versions but would like to before too long. These shell layers are typically warn with the following items, which are shown in the numbered photograph above the main list. I use Garmont ‘Finse’ boots with a modern step-in binding. I have never had a problem with these boots but after I saw the failure of the pair that Henry was wearing, I am looking to change to a welted boot, rather than boots that rely only on glue to hold the sole on. Garmont did also produce a traditional NN75 boot that was welted but Scott Sports bought Garmont’s ski boot business in 2012. As far as I can see from Scott’s website (which I find quite counter intuitive to navigate around), they no longer produce leather ski boots, concentrating on producing only modern plastic downhill boots following on from Garmont’s previous designs. So I think I’ll have to do a bit of searching. That completes my basic clothing set up. If it’s colder than I’m comfortable with for the effort I’m making (or about to make), then I start pulling extra layers, warmer headwear and handwear out of my main pack. I try not to have too much in my pockets. An excess of items in your pockets makes your clothing not sit properly on your body and can be uncomfortable when moving. You can also hurt yourself or break items if you fall over. I keep things in my pocket which are useful to have to hand while travelling during the day plus a few things I don’t like to have to root around in my pack for when I need them. These items are useful to have handy while in huts as well outside. You are not going to get very far without these. Nordic mountain touring skis and sturdy poles. For the past few years I’ve been using Madshus Glittertind skis and Swix Mountain Poles. Mountain touring skis and poles. Western Setesdal Mountains, 2007. Photo: Paul Kirtley. There are not transceivers in the above kit due to the terrain we were traversing and routes we were taking (we took a significant detour to avoid an area known to be prone to avalanche) but I have taken and used transceivers in Norway before as well as further afield. I have several of the well regarded BCA Tracker DTS model for use by myself and companions. If you are skiing in terrain where avalanche is a possibility, then you should all be wearing transceivers. Before you head out, make sure everyone knows how to use their transceiver and have practised locating transmissions of other transceivers with theirs switched to receive. Make sure everyone knows the importance of switching them off when you have found someone too. These SEND devices – such as the popular SPOT device – allow you to send simple check-in messages or allow others to monitor your progress if they have a tracking mode. You can also send an SOS message. PLBs have no communications functionality but higher reliability in delivering an SOS message than a SEND device. They have no ability to call or message anyone in non-critical situations. Gold standard for wilderness communications. Great for remote trips when you may need to speak to a doctor or gain other non-critical advice where sending an SOS message or instigating a search would be unnecessary or inappropriate. Expensive and possibly overkill for trips in areas that generally have decent mobile (cellular) reception nearer to roads or inhibition (such as much of Scandinavia). 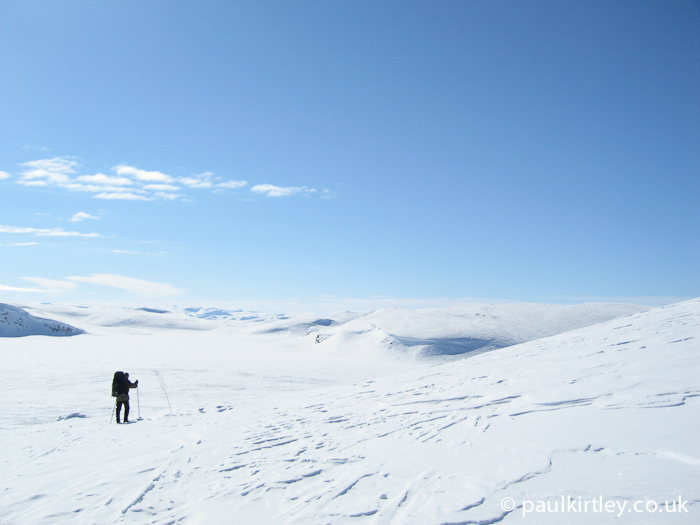 I pack a satellite phone on remote trips with clients but have yet to see it as necessary on a personal trip in Norway, although if I undertake another trip across the Hardangervidda with only one companion then I will seriously consider taking one. Be sufficiently experienced and fit for your intended trip. Leave word of your route. Always take a rucksack and proper mountain gear. Turn back in time; turning back is no disgrace. Save your strength and dig a shelter in the snow if necessary. Click here to read the Norwegian Trekking Associations guide to staying safe in the winter mountains. 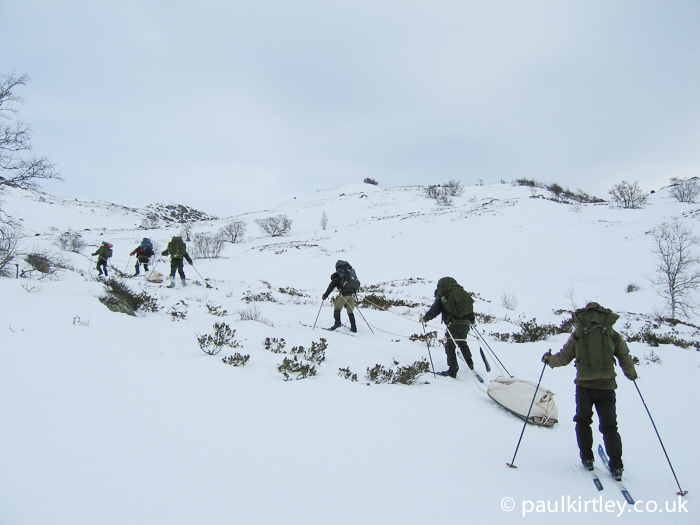 The Norwegian winter mountain environment is challenging but with the right training, experience and equipment this terrain provides one of the best opportunities for wilderness adventure in northern Europe. Hardangervidda, 2006. Photo: Paul Kirtley. Regardless of whether you take a SEND, PLB or Sat phone, remember to leave details of your planned route with a responsible person, with details of when you are expected back, when you will check in and what to do if you are late. Click here to read more about the importance of leaving word and for an example document format you can leave. Paul: Thank you for taking the time to lay out this extensive list of gear carried on the Norwegian trip. 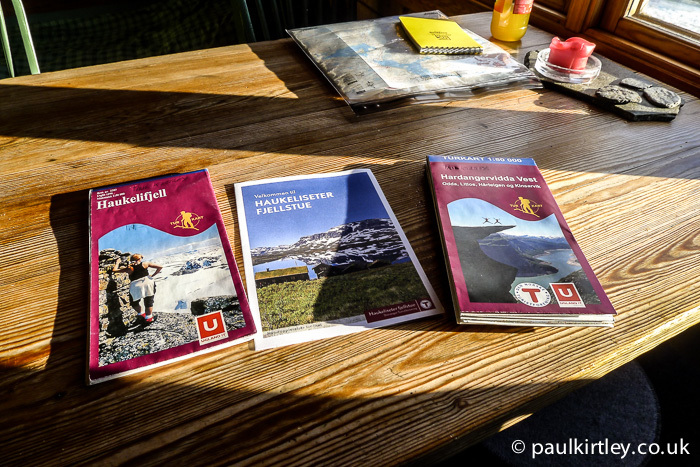 Both the ‘Equipment For….’ and the previous ‘Fjelltur: A Norwegian Adventure’ were terrifically fascinating and much appreciated. Thanks Ron. Your feedback is really appreciated. About cameras: I like the Ricoh WG-4 camera as an “always there” bush camera. It is surprisingly compentent, and very rugged (waterproof, shockproof and coldproof, even if only to -10C, but still). With a 32 GB memory card and a spare battery or two it is handy way to take quite decent photographs with no worries about the camera having to be overly protected. I often carry a largish gorilla-pod for it. Good to hear from you and thanks for your comments. Thanks for posting this article, although I am not likely to go skiing in Norway (nor anywhere else for that matter). It is interesting to see how the ‘basic’ kit is a development from your Bushcraft kit. I like the tip about non metal items, such as using a plastic spoon in the cold weather. This would apply to any cold environment, including here in the U.K.
Hi Steve, thanks, I’m glad you found this interesting. On the GPS I have the Foretrex 301 and it is a fantastic GPS as you mention about the 401 it is a basic model that doesn’t have maps but is great to aid navigation and also has the ability to put in waypoints so you can get back to your last known position etc with ease. That’s good feedback. Thank you. Love your Blogs. Very informative and detailed. Makes me want to get up and get out but a bit restricted for health reasons. I look forward to using your advice and would be only to happy to go and explore my native country Ireland. Some day. Thanks for your comment. I’m glad that you’re finding my blogs informative as well as inspiring you to want to get out more. I’m sorry to hear that you are somewhat restricted in what you can do but I hope you can get out and about, exploring Ireland. You have some lovely countryside over there. Wov! Extremely extensive kit list. Great content. I do (and guide) a lot of winter tours but with slightly different approach: mostly staying in tents and almost always skiing with pulkas (enables comfortable camping in tents on treeless areas and makes ahulign food for week or several easier). But dispite the different style I agree with most (or almost all) of the kit you listed. Personally I’d go with Voile shovel (BDs seems to break more easily in seriosu use). 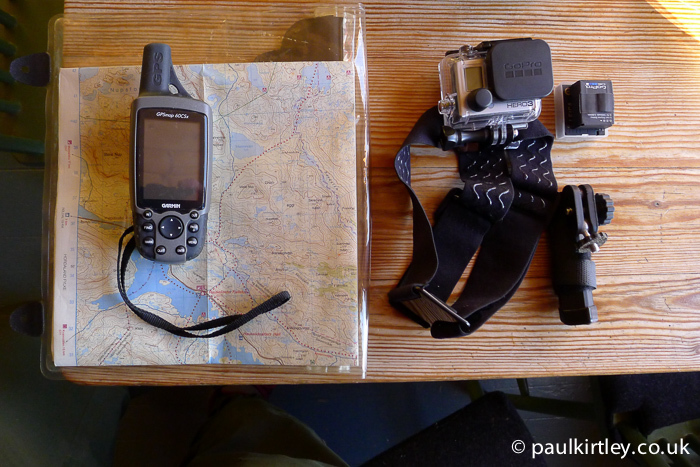 And also I use GPS quite a lot but also carry maps when they make sense and use compass a lot in bad visibility. And as I’m lazy with the skis wax I prefer skis with scales in the bottom for grip (also better for the glue in the skins). And things like this but they are mainly matter of style. The advice in the article is very sound and extensive. The shop is associated with the ski expedition courses and tours I’m guiding so feel free to remvoe thel inks if you want but I thought it might be good info as these are difficult to get. Thanks for your comments. I understand about the pulkas too. I agree the Voile shovels are very good. I have one in my winter mountaineering kit. I like the fact they make them with D-grips, for easy use with mittens. I’m coming round to the waxless skis. I tried some for the first time when I was in Norway last year. They are slower on the downhills but I enjoyed the increased control I had while skiing with a backpack. They are also less hassle than waxed skis with the daily maintenance of waxing, removing klister (horrible stuff), etc. Thank you in particular for the link to the overboots. I have no problem at all with you posting these links, even if you are involved with the company. A good product deserves to be found and the people who make it to be rewarded, particularly in niche outdoor products, which can be a hard place to make a living. I hope this allows more people to find out about what look to be a very good product. Thanks again for adding to the conversation and I look forward to following your adventures via Twitter. Once more unto the breach dear friends once more. Thank you so much as always for your time and generosity in sharing your knowledge and wisdom in these articles, they are very much appreciated. This one is particularly appreciated as being safe in these conditions is very much to my heart, plus it is nice to see how the experts arm themselves-I’m getting there. I deeply regret having sold my Vulcan in favour of a Karrimor 60-100 as it was a fantastic bergan which was simple, light and extremely robust. My Karrimor had one of the side zips break upon it’s first use, and it is heavy which makes for a tendency for me to scrimp on contents as a result. Some fantastic little tips in the article should make anyone’s life a lot simpler when following in your footsteps. Top man. You’re very welcome. I do enjoy constructing articles like this. It’s more than just a kit list. I’m trying to get across the philosophy and considerations in using the kit too. I hope they help people get out there and have their own adventures too. But I’m keen that people don’t have mis-adventures, so safety considerations are also a key part of the message. I had a Karrimor SF 60-100 too. My first proper hiking pack (bought in 1992) was a Karrimor Condor. I did many solo backpacking miles in the Scottish Highlands with this pack. It was a well thought out pack and very comfortable with the SA back system. I really liked it but eventually it became somewhat worn and tired. Having had a good experience with the Karrimor SF Sabre 45, I bought the 60-100 which has a similar design and SA back system to the old Condor. I found it too heavy though (it was heavier than the Condor) and sold it on Ebay. I now tend to use a Crux AK57 for summer backpacking trips. It’s a very good pack, very tough yet weighs only 1250g. It’s not big so exerts discipline on your kit choices and although that is a little tight on space I manage to carry what I need. I can’t get more than a 6-7 days of food into it. It is certainly too small for winter expeds, so I continue to use my Berghaus Vulcan (bought in 2002) for winter trips. Simple and functional. Just what you need for winter. Glad this article was useful to you Kirkland. Let us know what adventures it helps you get up to! What’s a pulk? Ok,ok I figured it out! Here in Michigan, some items on your list aren’t available, but companies like Eddie Bauer,llbean and Carhartt offer quality clothing and gear. I am interested in skin protection in the cold, especially cold with wind. Have any recommendations? I hear Eskimos used seal oil to treat their skin. This topic is generally overlooked in winter bushcraft kits, but, I can tell you, it’s essential here. Thanks for this most comprehensive breakdown of winter kit. First I’ve ever heard of a pulk. Good to hear from you. Thanks for your comments. The best tip I have been given regarding protecting skin in the cold is not to wash! What I mean is don’t wash your face. When you do, you strip it of natural oils, which protect it. Shaving is particularly bad from this perspective. I try not to shave much if at all in cold environments but if you do have to shave, do it the night before you have to go out again and preferably that night is in a warm environment. Don’t slap water-based moisturisers on your face just before you go out. Put them on the night before, then don’t wash.
Use a good lipsalve, which stays soft in cold conditions. Some lipsalves go hard as candle wax and are next to useless in cold temps. The Swedish Hudsalva brand (in my pocket items in the article above) is the best I’ve found but hard to get hold of outside of Sweden. Great article, thanks for all the time you take to share! Your equipment list is very apt as yet again someone has had to be rescued from Snowdonnia wearing trainers! I really enjoyed both the video and the kit article. I am just beginning to try winter camping in Germany, nothing extreme, I know. But the information is helpful for future use. And I am always looking for good kit! Yes, this will be useful to you in building up a good winter camping outfit. Another excellent article. One question Paul.. What was the overall weight of your ruck sack with the described gear? Thanks in advance. Paul as usual another great and interesting article. You mention you’ve updated your med kit to cordite pouch. What do you go for ? Is it worth adding the update to the original post and an add on comment? Maybe one day, I’ll write a book. I certainly enjoy writing and for people to be able to share my experiences. Thanks for the tips and what u use in your kit setup. My pleasure James. Thanks for your comment. Good, complete list! You even gave me a few ideas on what I am lacking!!! Just curious… Do you carry any sort of ski repair kit? I use 75mm three pin bindings so I carry four screws compatible with my bindings (three for the actual binding, one for the heel plate). I always carry a multi-tool so I always have a screw driver for the screws, and if need be, could use the awl to make some new holes to re-mount the binding a bit ahead or a bit behind the original screw holes if I had a complete blow-out and ripped the binding from the ski. I carefully wrapped several feet of duct tape just below the handles of my poles. I never measured how much tape there is, but I estimate it is around 8 feet on each pole. The weight is unnoticeable and the poles don’t feel top heavy. I only carry one spare basket and two cotter pins for the pole bottom. ( My baskets are installed with cotter pins.) I have never lost both baskets so limiting myself to one spare cuts a few ounces of weight off. In addition to this gear, I carry a 6 inch length of PVC pipe (split from end to end), 2 small hose clamps, 2 larger hose clamps and two pieces of metal cut to 6 inches in length. I have never had to use these things, but the idea behind them is to be able to construct a splint similar to what you would construct for a broken bone. For a broken pole, I figured I would slip the pipe over the break (having the pipe split from end to end allows you to snap it on instead of requiring you to remove the basket to slid it on) and wrap it in duct tape and then use the hose clamps to really tighten things up enough so it could be used again. It won’t be pretty, but it’s not a beauty contest. For a broken ski, I figured I would use the tape to hold the break in position and use the metal as the splint. The larger hose clamps hold the metal in place (you want the screw on top of the ski to keep it from snagging on the trail). Ideally I wanted to use aluminum corner guard because the “L” shape would stabilize things not only from top to bottom but from side to side as well. I’m still looking for something suitable. In the mean time, the metal pieces I carry are cut from flat stock 1.5 inches wide and 1/8 inch thick. I think once everything was in place, I would wrap the entire area in duct tape again to make things as smooth as possible so the ski could still “glide”. I’m still working on a small and light weight replacement ski tip and haven’t come up with anything spectacular… Anyone have ideas? Another thing I am working on is attaching a LED light to the ski pole directly below the handle to be used as an auxiliary light. I’d love to hear your thoughts on that! Great comments. You know, this aspect – the ability to fix anything on my ski equipment that could conceivably break – is something I’m not happy with in my kit. Partly it is the design of ski bindings (Rottefella Back Country) and boots I’ve been using in recent years. One option is to carry a spare binding and screws and I have done this in the past but they are quite bulky. I’ve had one rip off the ski only once in the past but that was because the shop didn’t fit it properly (the screws were too short) and luckily I wasn’t far from home as it was my first outing on them and was trying them out. With the binding being largely plastic, though, the main issue was that the binding broke in half. But after the issue we had with Henry’s boot on the last trip we did in Norway, I’m looking to move over to NN75 bindings, partly so I can use a welted boot. I also think the NN75 bindings are more field repairable. You can certainly easily carry spare cables and the metal toe part of the binding itself is more inherently robust. Would you agree? I carry duct tape, electrical tape and cable ties as they have multiple uses but I like your pipe and hose clamp idea for the specific problem of a broken pole. Interesting idea with attaching a lamp to the ski pole. It’s a different area but my experience of attaching lamps to sticks is in the realm of tracking. There are some advantages to having a light mounted low down when tracking at night as it shows the texture of the ground – and therefore disturbances – very well under some circumstances. I guess it could also be beneficial when trying to ski at night, even in poor visibility (similar to mounting fog lights low down on a vehicle). I’d be interested to know more about the circumstances you were thinking of? Of course, heavy duty bindings should have heavy duty boots in them… Take a look at the Alpina Alaska 75 Back Country. I’m in these and very happy. They are a sturdy boot with plenty of ankle support. They are expensive, but you get what you pay for and I doubt I will ever wear them out. One added bonus with these boots is that you can wear gaiters without the binding interfering with the strap under your foot. A definite plus in powder as I’m sure you know! The light I am using is a Nebo Flashlight 8 Led Work light. I bought my light at a local lumberyard / hardware store, but I’m sure you could find it at amazon.com. I’m near 63 degrees North latitude, so I confess; my primary reason for the light is to extend the time on the trail. I also do some tracking every now and then and I do carry a light to differentiate track features, but the light I use for that is a round LED. Incidentally, if you shine a round LED through a magnifying glass you can concentrate the beam. Doing this creates a “spotlight”… You’ll have to vary the distance between the lens and the magnifying glass to get the beam to focus exactly how you want it. I’ll bet you can “fine tune” a beam faster than I could explain how to do it… Might be a good trick to remember if you had to do an avalanche recovery at night or needed a signal for some other survival reason. They are easy to find in stores here in Sweden and online, so they might be a good alternative if Lill-Sport are hard to come by. Yes they are similar and even higher up the leg. Thank your for highlighting these and sharing the link. I think your information is very useful, especially for beginners. Having said this, Nordic Ski Tours are my passion for almost 30 years now and I would like to give a little bit feedback. As already others said, I would not recommend wax skis for these kind of tours anymore. 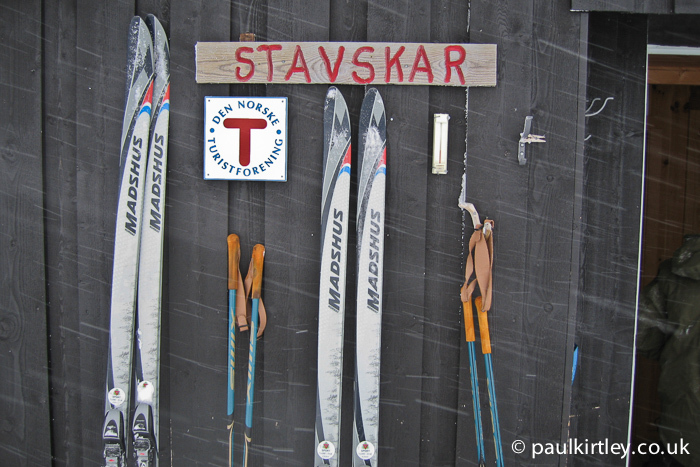 I used them in the past, but after a trip on the Kungsled in Lappland I changed my mind. Due to changes from wet snow to dry snow I got crasy to wax the skis accordingly what cost quite a lot of time. Wasting time on s ski trip can couse trouble later on, when the sun goes down and you are late on the trip. Moreover, you can also safe quite a bit of weight not having wax with you. I also shy away from all modern bindings, the new Rottefella Chilly is my current favorite. The Swix mountain ski poles are also long and trusted companions. I almost fell down a mountain in the 90s when I was using Leki telescope poles and the pole segments started to move as I needed them most. According to the GPS, I am also using the Garmin 60CSx and I believe that this type of GPS is the best. It is reletively easy to use this unit with gloves, what is for me very important. For difficult trips, when I really might need a GPS, I bring two of them. Funny enough I also use the Silva 15TD-CL. When it comes to the snow shovel, I replaced my Black Diamond Lynx by a Voile Telepro T6. From my experience this is the best Snow Shovel on this Planet and not even expensive. There was a test in the magazine Bergundsteigen 4/08 where this shovel survived all tests without failure, while other big brand shovels failed and looked like a crunched beer can. The second very important item is the wind sack an here I use either the Hilleberg Vindsack or the Helsport one, depending on the trip and if I have a Gore-Tex Sleeping Bag Cover with me or not. As sleeping pads I always use closed cell foam pads. My favorite is the Ridge Rest. On a trip I bring two of them. If I have my Fjellpulken KIII with me, I bring a Therm-A-Rest as well. One very good idea I had not myself yet is to wrap the shovel’s telescope handle with some kind of tape. I see the added value more on the side to have more grip than the insulation perspective itself. I will try it next time. From my perspecive, a full tang knife is as importand as the saw to be able to split wood by batonning. 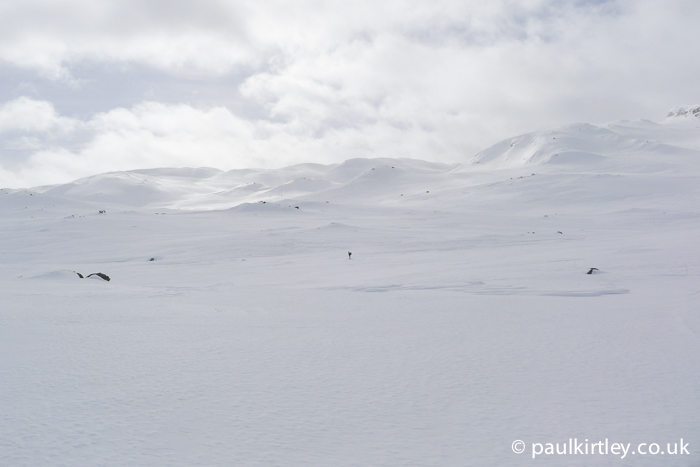 I agree not to carry an axe through the Hardangervidda, but I had an axe on my Kungsled trip in my pulka. Believe it or not, in one shelter I needed the axe to make firewood, because the shelter’s axe was missing. That said, I also bring Bob Destrude’s folding buck saw as well when I have a pulka with me. According to clothing, I miss in your article the importance of a fur ruff. The difference between a hood with or without a fur ruff is enormous. I also use Norröna clothes most of the time. If I stay with my family in a cabin, I still use my rotten Norröna Arktis Anorak, but on a serious trip above the tree line, I do not use Cotton as outer Layer anymore. If I am sweating as usual, the outer cotton layer gets wet and if you put it off, it can freeze stiff. On one trip in the past this was an issue, because I had a problem to put on my anorak. I also disagree to use Lars’ Fjell gloves if I have to dig into the snow. I use a a Gore-Tex mitten with a synthetic liner and/or fleece gloves. They just dry out quicker, while you need an oven to dry Lars’ gloves. Lars’ gloves a very fine for fire wood making, but most of the time I just use cheap thinsulate insulated working gloves which cost me litte monney. The pro and cons of woolen underwear can be discussed endless. I used Woolpower, Brynje Arctic, Helly Hansen PP plus Patagonia Expedition weight and without any doubt, that last combination is by far the best. It just dries out faster if you don’t have a fire or oven in the cabin. Unfortunately, you cannot get the old Patagonia anymore. A not that bad replacement is the ECWCS layer 1 and layer 2 combination of the US military. My next level is a TNF Denali fleece Jacket, and if it is really cold or windy, I have a 200 type fleece on top. Only on my feet I still use wool, a medium and a heavy weight combination. A Gore-Tex pants is another must have if it is really cold and windy. Not to mention a fleece trouser as additional insulation. Maybe I have overlooked this in your article as well, but I believe that gaiters are another must have in the snow. Last but not least I either use the ECWCS level 7 jacket and pants or the Bergans Expedition Down Parka and Bergans Expedition Salopette, which are especially designed for ski expeditions. The last very importand part is my Fjäll Räven Polar Heater. This hat is just warm and very appreciated during low activity phases. One other important topic is hydration. These days I bring an 1l thermos and a one liter Nalgene bottle with a thermo cover. I feel that one liter is just not enough to drink. I start usually with the Nalgene which cannot keep the warmth like a thermos and later on I use the thermos and add snow to it. I see that you use a lot of dry bags in your backpack. While this is for sure not a bad idea at all, I use dry bags only for my food bag. I feel that they add unneccessary weight to me and I use most of the time simple nylon or plastic bags. However, the dry bags can be very useful if you fall through the ice. I might have a closer look to the very light silnylon dry bags. Not described in your article are winter tents. I only use Helsport extreme tents with snow flaps, most of the time I used the Svalbard 3. I share the opionion of the Norwegians that snow flaps are a must. Other than that, my equipment is quite similar to yours. I hope my feedback is useful. God Tur! And to think I got paid for doing this every winter with the Royal Marines. Now I’d have to pay a fortune.